﻿ TimeZlider - Conversion at a Glance. Effortless time conversion and world time. Schedule conference calls, webinars & online meetings, plan travel and track flight arrival time across time zones. Effortless time conversion allows you to schedule conference calls, webinars, online meetings, plan travel and track flight timings across time zones, keeping in mind daylight saving hours. Compatible with iPhone, iPad and iPod touch. Requires iOS 5.0 or later. A combination of a time zone converter and an online meeting scheduler, it's one of the best tools for those who often plan online meetings, call friends and family abroad, travel frequently or track market hours. Covering over 20,000 cities, TimeZlider works well, even when you are offline. 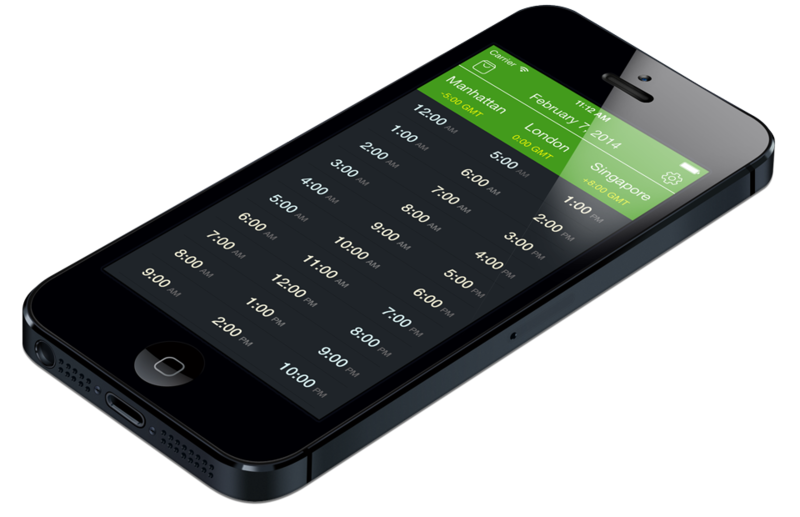 Simple and efficient, it lets you easily convert multiple time zones at a glance. TimeZlider was born out of frustration with existing world clocks, online meeting and time conversion tools. Most of which have given up on providing quality business tools and on delighting their users. Carefully thought out design lets it effortlessly convert multiple time zones at a glance, plan conference calls, webinars, international phone calls and web meetings. It also aids with business travel & tracking of market hours. Set locations by tapping city. Scroll through hours to convert time. Tap hour to schedule & share.